What lurks out there in the fog? What was that eerie sound in the dead of night? What flitted by at the end of the street, just beyond the farthest street lamp? From earliest times, tales of the restless dead and their fellow travellers have terrified mankind. Whether around a remote campfire or in the middle of a bustling city, the unquiet spirits and attendant creatures that have tormented humanity since the prehistoric darkness haven't gone away—they still have the power to strike fear in our hearts. Encyclopedia of the Undead traces those shadowy entities—vampires, werewolves, ghouls, and monsters—that lurk just outside the range of human vision and inhabit our most frightening tales. Drawing on a wide range of beliefs and literature, it traces these horrors from their earliest recorded inceptions and charts their impact upon the human psyche. In this book, history and terror mix to create the things that lurk in the darkest corners of our minds. You'll find detailed descriptions of terrors from all over the world—from the mist-shrouded mountains of Eastern Europe to the sweltering jungles of the Caribbean islands, from the dark, stone-lined tombs of the uncoffined dead beneath the remote New England hills to the dark magics that lurk beneath the thriving, colourful surface of a city like New Orleans. 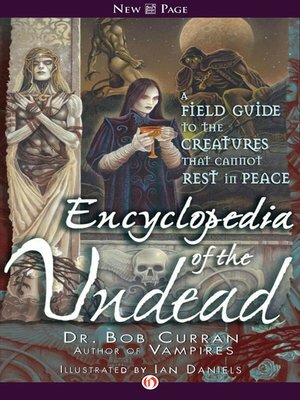 In addition to the more conventional creatures, Encyclopedia of the Undead also details some of the more obscure things that gnaw at the edges of men's minds—Incubi and Succubi, the Mara, and the dark legends that have influenced writers from Sheridan Le Fanu to H.P. Lovecraft. This is a book for all those who are interested in the darker side of the human mind—the side that examines and even embraces those beliefs and imaginings that form the basis of our most archetypical fears. This is the book for those brave enough to plumb the depths of our worst nightmares!